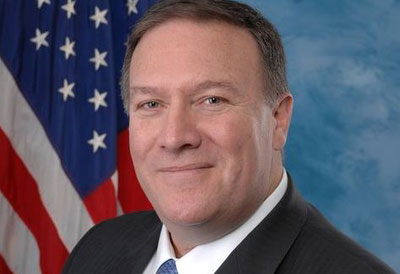 Rep. Mike Pompeo, R-Wichita, followed the government's advice on terrorism when he "saw something" and "said something" by calling out a known Hamas-linked speaker slated to appear at the Islamic Society of Wichita. Monzer Taleb – the "motivational speaker" invited by the Islamic Society to speak for a fundraiser – has publicly established and well-documented ties to the designated terror group Hamas. Taleb can be seen repeatedly singing the words "I am from Hamas" on video submitted into evidence during the Holy Land Foundation for Relief and Development (HLF) trial. The HLF trial – in which Taleb was cited as an unindicted co-conspirator – remains the largest terrorism financing prosecution in U.S. history, resulting in 108 convictions. Senior officials from the charity were sentenced to long prison terms for illegally routing more than $12 million to Hamas. Taleb continues raising money for Hamas by speaking at events sponsored by the Council on American-Islamic Relations (CAIR), which was also an unindicted co-conspirator in the HLF trial. Unsurprisingly, Pompeo takes flak from CAIR, which, like Taleb, was affiliated with the U.S. Palestine Committee, composed of several American-Islamist groups charged with politically and financially supporting Hamas in the United States. When not seeking money for the HLF, Taleb ran the multimedia department at InfoCom, a Texas computer company founded by the Elashi brothers, the very same men who helped run the HLF. The Elashis were convicted of laundering money for Hamas chief Musa abu Marzook and violating sanctions against Libya and Syria. Taleb lectured at the radical Islamist Islamic Circle of North America (ICNA) convention in 2009 where he helped raise $83,000. He was also a fundraiser for ICNA affiliate Helping Hand. Taleb delivers sermons for the Islamic Association of North Texas, which operates the Dallas Central Mosque. The mosque hosts a roster of icons in the radical Islamist collective. The people of Wichita deserve to know such relevant facts – and so should organizations around the country that may consider inviting Taleb to lecture at their events. The public should know about the true nature of his associations, dispelling rumors with factual proof introduced as court exhibits and affirmed by federal rules for evidence. Pompeo stood up for Kansans of all faiths against supporters of radical Islamist organizations and those who would attempt to infiltrate Wichita's Muslim population to spread support for terror. The American public wants to know that its elected legislators, law enforcement officials and community leaders of all stripes understand and are speaking honestly about the issue. "If you see something, say something." Pompeo was right to do so, and members of the Wichita community owe him a debt of gratitude. Pete Hoekstra is the Shillman Senior Fellow at the Investigative Project on Terrorism and the former Chairman of the U.S. House Intelligence Committee. Thank you very much for putting yourself into the limelight by speaking up against the supporters of radical Islamist organizations. Thank you and stand strong! Mr. Pompeo deserves every thanks from every American for doing this for us. More people should stand up and do the same. I know I would if the situation arises. This is a person we need in our government. I do hope he stays for a long time! I will write to him, and give him my personal thanks.